Today’s Design Vocabulary is an easy one to learn. You can probably already think of a great example of a chevron. 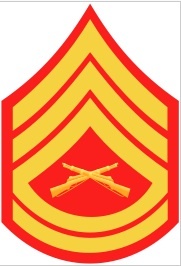 This is the rank insignia of a Gunnery Sergeant in the United States Marine Corps. (Semper Fi! Thank you for your service!) Chevrons in military use are linked back through history to chevrons in heraldry. Can you see the chevrons in the bottom left corner of the shield? In heraldry, the chevron traditionally symbolizes a builder or someone who has performed faithful service. 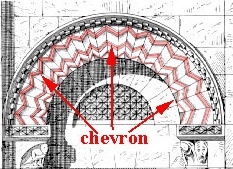 There are also chevrons used in architecture. Here is one version, which is used decoratively. Here is another version, used structurally. Can you see how those ceiling ribs come to a lovely point? 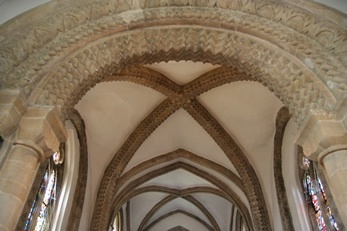 Those chevron ribs, or arches, help to distribute the weight of the roof. You find these in many medieval churches because they were a savvy architectural solution for their day. So now you know how to spot a chevron pattern like an expert. You can read a home/design magazine and exclaim with authority, “These chevrons are everywhere this year!” Do you like a chevron pattern? Where would you put one in your home? Posted on March 22, 2011, in Architecture, Design Vocabulary. Bookmark the permalink. 4 Comments. I was looking at material to cover a worn out living room chair yesterday. 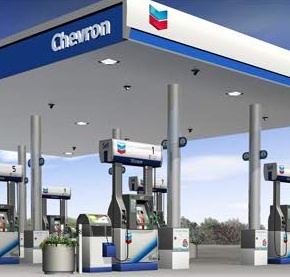 I didn’t know about a Chevron. I bought the material. Cool! Who knew! Love this! I’m doing over my hall bathroom. Love the Chevron pattern shower curtain! I love the shower curtain in the second to last picture. It somehow reminds me of falling rain. I’ll see if I can find one for my bathroom. Thanks! Never mind trying to find it. I found it: I clicked on the picture and just ordered one. Thanks again!